The tsessebe is a bizarre-looking antelope that happens to be one of the swiftest on the continent. Tsessebes have a very rich and dark red coat of fur, with a dark undertone and darkly colored underparts for the most part, but light areas at the back of their hind legs and their abdominal areas. Their knees are a lighter brown color, but the upper parts of their legs around their joints are a dark brown color. Like other hartebeest species, they have relatively small horns, curled back and slightly in. The size of these animals varies between sexes and animals of different regions. Males generally weigh between 111kg and 147kg (244 – 323lb) while females are slightly smaller as with most antelope species, around 90kg to 130kg (198 – 286lb) in weight. Within Southern Africa the Tsessebe is quite scarce in their distribution. The Kruger National Park is the only major nature reserve or protected area within South Africa in which they can be found. More north they can be found in parts of Zimbabwe and Zambia, to just south of the rain forests of central Africa and in parts of Kenya and Tanzania where more open grasslands can be found, greatly favored by some sub-species. The more northern populations on the edge of the Sahara stretch almost right across Africa, and are sometimes referred to as Topi. The only coastal areas which they inhabit are on the coast of Kenya. At the moment these animals are labeled as of least concern, although their populations have seen a considerable downhill journey within the past century due to hunting, loss of habitat to livestock and farming with the establishment of new human settlements and the growth of previous ones. Their strong population of 300 000 does not justify their current status or tell the full story of a species who once flourished as one of the prime antelope species of Africa now pushed back into scattered regions. They have seen a great decline in the past few decades, just falling short of being regarded as near threatened. About 25% of them inhabit areas that are protected with some more vulnerable sub-species found almost solely in protected parks and nature reserves south of the Sahara. In the past 30 years or so, their populations have been wiped out of many Sub-Saharan countries like Mozambique, Mali and Senegal among many others. Tsessebes or Topis have been known to favor open grassland areas where their tremendous speed and light-footedness can be used to its full potential. This is the reason for their wide distribution throughout Tanzania and the lowland areas of Kenya, Zambia and Zimbabwe down to the central plains of the Kruger National Park of South Africa. Savannah areas and regions with more scattered acacia trees or shrubs also seem to go down quite well with these animals. 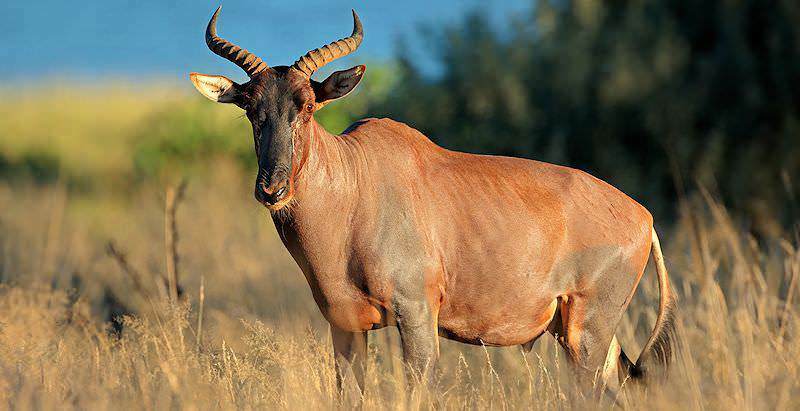 Tsessebes or topis may live as conventional antelope, forming herds and taking portions of rich vegetation suitable for sustaining a female group as a territory, but is only the case in areas where their population density is relatively low. On large open floodplains where they flourish as a species, the way in which they structure themselves socially changes drastically. Instead, they all live as one group, where males battle it out for females and leave their territories to go feed. Their numbers may reach the thousands in a case like this, and their population density is up to 50 individuals per square kilometer. This environment is known as an arena. In South Africa and the Kruger, the populations rarely reach this level where an arena is formed. Tsessebes are no different when it comes to territorial antelope, and regularly mark their territories by secreting a substance from their pre-orbital glands onto grass stems. They also like to cover themselves with mud, using their horns to spread and sling mud rather than their heads like hartebeests. After great rains have blessed the, always needy, African landscape, Tsessebes are frequently seen with magnificent horns covered in mud. Within their territories there also usually a termite mound, something they find oddly desirable, often used to look out upon their land or to seem larger and superior when defending the borders of their territory. During the 1 to 1.5 day period in which a Tsessebe cow is in heat, she may breed many times, with the same or different bulls. Pre-mating rituals start when a male identifies a female in heat, and starts making a bleating sound when approaching her. He puts down his ears and stand in an erect pose before mating. When she is successfully fertilized, she’ll bare their offspring for around 8 months before giving birth in the dense grass. Topis are strictly seasonal reproducers for the most part, although in some areas there are 2 distinct birth peaks rather than just the conventional peak in the early wet season. Tsessebes are very lucky when it comes to predator and prey situations, with them often discarded as prey by large predators when other prey is available, maybe due to their speed, although unproven. They usually display aggressive behavior when threatened by smaller predators such as single hyenas, such as raising and straightening out their posture, grunting or going on the offense especially when very small predators like jackals are after their vulnerable young. If they stand no chance against their attackers they can always use their strong running skills, running up to 80km/h, one of the fastest antelope species in Southern Africa. Botswana is wonderfully wild. Its safari destinations are painstakingly protected. Travel to Namibia for desert-oriented adventures galore, from Sossusvlei to Etosha. Zambia's top travel destinations are Livingstone, Kafue and South Luangwa. Zimbabwe offers off-the-beaten-track safaris in Hwange and Mana Pools. Mozambique travel comprises ocean safaris and beachside leisure. The Kruger National Park's fine infrastructure and wide range of accommodation options means that it can cater to various budgets. South Africa's Sabi Sand Private Game Reserve offers the quintessential luxury African Big Five safari experience. Cape Town's alluring attractions range from the iconic Table Mountain to the historically significant Robben Island. The Garden Route's coastline offers an extraordinary range of adventures, from whale-watching to swimming with seals.